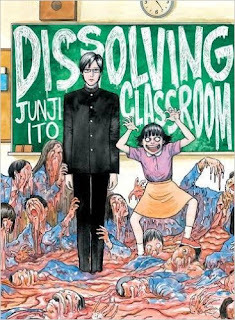 Dissolving Classroom is a series of 5 short stories following brother-sister duo Yuuma and Chizumi Azawa, in whom's wake strange and disturbing happenings trail. It's the third post-8-year-break-from-comics Junji Ito work to be published in English, and was originally serialised in Japan 4 years ago. The timeline of Ito's translated works is worth mentioning, because on one hand you have some of his seminal manga such as Uzumaki, Tomie, Gyo, and on the other you have these more recent, waning-quality works in Fragments of Horror and Cat Diary. For Ito's English-language audience, at least, it presents a starker disparity in standard. Dissolving Classroom starts robustly enough, as the Azawa siblings and their particular brand of horror are introduced. Mild-mannered new student Yuuma quickly gains a reputation for his overly profuse apologies, which increase in volume and bizarre extravagance when people discover his creepy younger sister Chizumi is responsible for numerous odd incidents around the neighbourhood. Ito paces the opening story well: parcelling out plot to harness the reader's curiosity, whilst ratcheting up the tension. Moreover, the idea, too, is classic Ito in the skewed inversion of the benign everyday; making a 'normal' thing disturbing via ridiculous extremity, in this case taking on social mores of politeness. Yuuma derives masochistic pleasure from his apologies, gleaning power in submission; in weaning not only forgiveness but discomfort, even revulsion, from people. Over a contracted period of time, exposure to Yuuma's words have a literal effect of turning people's brains to mush; a mush that a hungry Chizumi is happy to devour. On the surface, Dissolving Classroom's second story finds Ito playing to familiar strength, as he once again addresses the relationship dynamics between men and women. Here, Yuuma's word-power is applied to flattery of his beautiful girlfriends, turning their features into misshapen hideousness, while they alone are unable to perceive the change in their appearance. But it's unclear what's being got at, if anything: something thin about the harmful, quite nerd; psychologies of self-belief and insecurity; narratives of abuse; another power switch in controlling/confining beautiful women? None of it quite gels. Beyond this point Dissolving Classroom meanders and weakens further, as Yuuma and Chizumi move from place to place, repeating their cycle to diminishing returns for the reader and themselves, culminating in a newspaper expose and a televised public apology. It's possible that buried somewhere deep within is a knowingly rambunctious tale of parentless, adventuring children traversing the country, but you'd struggle to eke it out. 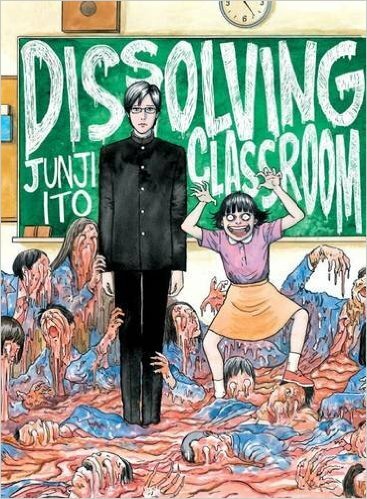 For a book that features 2 kids toting around the decapitated heads of their parents as a moving shrine, a cache of bottled human matter as sustenance, and appearances from the devil himself, Dissolving Classroom is a remarkably unengaging, almost insipid affair. It's not only Ito turning to as obvious a big bad as the devil, but that the resultant handling is so tame and prosaic, that is symbolic of his stagnation. Better instead to leave Yuuma's and Chizumi's actions purposeless, unexplained. More than ever, it's apparent that Ito's coherence in relation to his ideas has faltered. The tank splutters, but fails to cough up enough to get the engine thrusting. Both the clarity his work used to have in executing an idea, and the punch that the strength of the idea would provide, is missing. This, in turn, affects his cartooning, which whilst retaining the same level of technical competency, lacks the visual potency an inspired concept would provide; a full-page splash of Chizumi wearing poorly-applied make-up, for example, is given the space for impact but falls resoundingly flat. Images of people with brain goo flowing from eyeholes and orifices are too generically atypical to resonate. It's fair, too, to posit whether Dissolving Classroom is merely poor, or poor by Ito's standards. To any new reader, the outlandish weirdness of his work is no doubt still enough to make an impression. But where Fragments of Horror was uneven, Dissolving Classroom seems to give up, losing interest in itself. There's a curious lack of purpose to it all, and crucially, no horror. Once able to weave the sinister and absurd into tight, 32-page chapters like no other, Dissolving Classroom finds Ito lost, like somebody repeating part of a phrase in the hope that the whole will come to them. It never does.